My Australian Shepherd is two years old and has always been wary of men. Has always barked at my brother and stepdad and fiance. 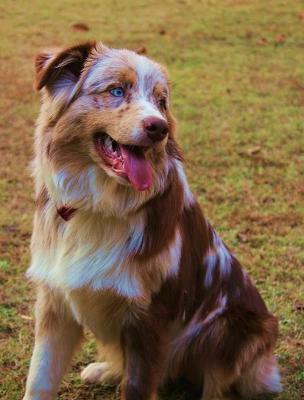 My fiance and I moved in together about 8 months ago and whenever my fiance would walk in the door my Aussie would bark at him aggressively, and whenever my fiance raised his voice he would bark. But the other night my Aussie was sleeping beside our couch and my fiance made a lough noise (making fun of me about something) and obviously startled my Aussie and he barked and bit my fiance. Obviously I am upset and I don't know what to do. Do I need to find a trainer? I just don't want it to happen again or get worse. He has never showed any aggression towards me.